Chandler Harper has won 7 championships on the pro golf tour and has finished second in 13 others. His most prestigious victory was the National PGA Championship in 1950, at the time still a match play tournament. Much of the golf world remembers him for the big one he did not win. In 1953 at Tam O’Shanter in Chicago, Harper appeared to have the World Championship won. In fact, the $25,000 first place check had already been written with his name on it. Harper had already finished when Lew Worsham struck a wedge 134 yards into the cup on the final hole for an eagle two. That shot heard around the world won Worsham the $25,000 and a series of exhibitions at a guarantee of $1,000 each. Harper figures the shot cost him $100,000. A victory would have made him leading money winner of the year. Instead, he was fourth. Harper lost the Tournament of Champions title at Las Vegas the same year when Al Besselink sank a long putt on the final hole. In 1954, Harper won the Texas Open and amazed the world of golf by shooting 63-63-63 in that order; that 189 stands today as the 54-hole record. 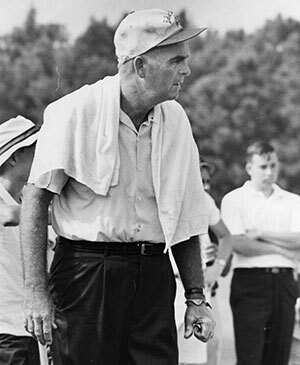 Harper, a member of the Ryder Cup team in 1955, won the Virginia State Open a record 10 times, and has also won the National PGA Seniors and the World Seniors titles. His lowest 18-hole round is 58 and his best 9-hole score 28, which he has equaled 16 times. But the honor that pleases him most is being voted into the PGA Hall of Fame in 1969. Only 39 golfers were in the PGA Hall of Fame until 1969 and none have been installed since only members of the Hall of Fame voted at that time. A graduate of Wilson High School, where he played on the golf and baseball teams, Harper turned pro at 20 in 1934. He was an assistant to Hix Joynes and Walter Beckett at the old Truxton Manor course in Norfolk, where Norfolk Regional Airport is now. The same year Harper played in his first pro tour tournament, the National Capital Open in Washington, and finished 11th. But only the top 10 won money. Harper was head pro of the Glensheallah course here for 17 years then helped build Elizabeth Manor. A year later he began building Bide-A-Wee golf course, which opened in 1955. It has been the site of Championships owned by the City of Portsmouth.